We made our annual trip to the Cider Mill this past week. The weather was absolutely perfect for the fall trek, cool and crisp with plenty of sunshine to keep us warm. We wandered the grounds, ate our doughnuts, and drank our cider, and then (of course) I took pictures like a crazy person. 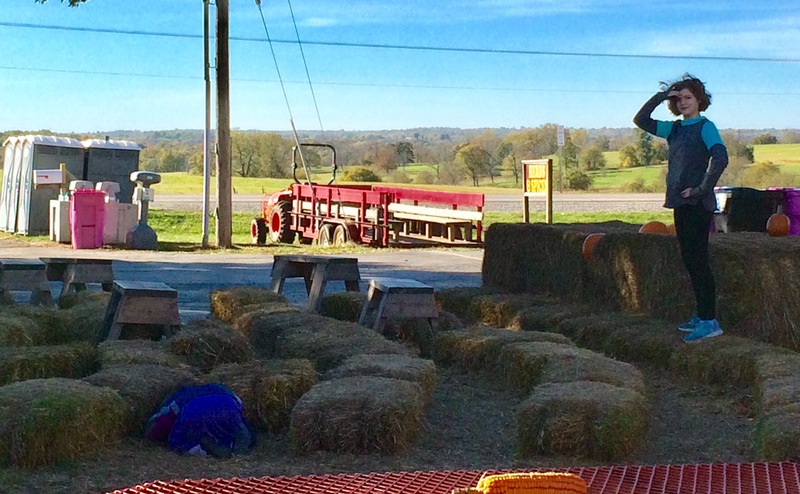 Hide and seek at the Cider Mill….because, why not? When I finished and turned them loose, I turned to see an older woman smiling and holding out her phone. “Would you mind taking a photo of us?” she asked with a smile, gesturing toward two young-adult daughters and her husband. “We never manage to get all together like this.” I agreed–who wouldn’t! ?–and snapped a handful of pics of the four of them. As I handed the phone back, she complimented me on my “beautiful family” and my four-year-old’s darling dress. I sincerely hope I can adopt that attitude. A shift in mindset of that magnitude changes everything. I wonder what adventures she’ll lead us on; what paths we’re going to walk down because she exists. I know that the past two years of depression with my oldest would have been incredibly more difficult for me, without this little one’s unrelenting joy and sunshine to wrap myself in. Snuggling with an inquisitive, cheerful preschooler has been a blessed antidote to many of my days. Maybe the “keeps you young” has already been happening. Maybe she, with her sweet spirit and loving nature and concern for others, has been keeping me from being beaten down prematurely as we walk the dark, ugly path of depression with our son. And how blessed we are now, to have him healing and returning–almost always–to his tenderhearted, sweet self (with that sly sense of humor). She was, somehow, always thoroughly untainted by her brother’s moods; now that unceasing joy allows us to rejoice more deeply in the healing that is taking place. Our lives were changed dramatically with her arrival. But as my husband and I were discussing last night, there hasn’t been a single change for the worse. God knew exactly what we were going to need at this point in our lives. We can’t imagine life without her. Yes, she keeps me young. I forget in how many ways we are different, and are living life in a simpler way. We haven’t gotten too off-course from my goal of “enough” (in spite of birthday season), and we really aren’t quite “average.” The past few days reinforced that idea for me. In a way, it started Monday night; the last night of a four-week Bible study I was attending. We usually have very quiet evenings, and me being gone four Mondays in a row was a serious shock to the family system. (Obviously, they all did fine.) Bedtime hugs and kisses were doled out at 6:40pm since I wouldn’t see kids until morning…..
…and the next morning we hit the ground running a bit harder than usual. I dropped my youngest off at her preschool, then stopped by the library on my way to a chiropractor appointment. I had a bit of time at home (long enough to flip laundry) and then collected my older daughter to tag along as we picked up the youngest from preschool and headed straight to Target for a quick lunch (um…ick) and a shopping trip involving birthday gifts for their brother. We were having all sorts of fun, wandering and smelling candles, when I literally gasped so loud it scared the girls. Oh, yeah. We stopped back by the deli and grabbed an Icee. Headed for home, unloaded stuff, loaded boy, sat in a waiting room for an hour, and tried to breathe. Back home I collected the girls and RETURNED to Target WITH the Redcard to get our 5% off all that stuff we just bought earlier. (Sigh.) One last gift for brother. A few clothing items for my older girl, who is rapidly (again) running out of clothes to wear, regardless of how often she does laundry. Got home and started dinner and ate together--on days like today, I consider the fact that we still managed to eat together a HUGE win. While my husband and older daughter cleaned up dinner, my son and I jumped back in the car so I could drop him off at a homeschool group event. I hung out to talk a bit, then headed home to put my youngest to bed while my husband ran to the grocery store. Once both girls were down, I headed back out to make sure I was there to pick my son up at 9:00; only to check my messages in the parking lot and realize the group was running late and maybe push pick-up back to 9:30? Well…..guess I’ll gas the car now. Returned for pick-up and more talking. Home by ten. Completely sacked out by 10:45. I knew going into the week that Tuesday would be the worst, Wednesday would be a bit better, and by Thursday, the end was in sight. At some point mid-Tuesday, I stopped and looked around and had a sudden, deep awareness that some people live like this all the time. Mine were a crazy few days, but for many, that is everyday. That is how countless people are going through their lives: a bit like pinballs, bouncing from one thing to another in an endless–and sometimes mindless–run. That is what an average day looks like, for an average person. And thankfully, SO thankfully, that is one way we’re different. Today we are home. Home for an entire day. The bigs are at the kitchen table with me, coloring while I write. The four-year-old is camped out in the living room with her My Little Ponies My laundry for the day is done and my daughter has started hers. The kitchen is clean and the coffee is fresh. We have discussed a library run, and put it on the back burner. All the kids are still in pajamas. It is the best kind of day–especially after the week we’ve had. I’m so, so grateful that this is our normal; that we are, actually, a little bit different. I picked up my phone one morning to find I’d been tagged in a Facebook comment in a homeschool group. The original poster had questioned, Anyone unschool older kids? My daughter’s preschool teacher had promptly tagged me. I just about dropped my teeth. Unexpected milestones in life: getting tagged in an unschooling post. As I thought about it, it struck me: what are we, exactly? We are absolutely not open-and-go, curriculum-in-a-box, structured schedules with desks in a corner. We are not School At Home. But as I explained in my comment, we really don’t fall into the “full-fledged, hard-core unschooling tribe,” with everyone doing their own thing and following their interests 24/7. We are VERY….relaxed and eclectic. But we are not Unschoolers. But surely there are more of us wandering around in the middle? Our own homeschool has had a very gradual shift over the past five years. This year, each of my older kids has a spiral notebook, and every Monday there’s a note inside for that week of school, telling them what their “must-do’s” are. We start slowly and ease in to the school year, but a normal, average week involves a few constants; I think of it as the “spine” that everything else hangs from, or the foundation everything else builds on. Each child reads everyday from their “book for school” (I have a book list for each child, but they choose from it what they want to read). They each have daily math (my 11-year-old daughter is in Teaching Textbooks 6, and my 13-year-old son is working on Horizons Pre-Algebra with a tutor). Science is also daily; this is effortless with my daughter, so she’s on her own with library books/an astronomy textbook; this is NOT effortless with my son, so he’s working through Apologia Physical Science bit by bit. They also write at least once a week (this is effortless with my son, but even my daughter is willing to do a Friday Free-Write with a good attitude). We do other things, of course, but this is our base. Over the course of the week I jot down anything else school-related in a long list under Monday’s note. And that makes us…..(what kind of ?) schoolers? Our days look different for each child. My son is very structured. He gets up between 7-8, starts his personal morning routine, and then jumps straight into school, to “knock it out” and “get it out of the way,” so he can do what HE wants to do. (Definitely no full-on unschooling here.) What he “wants to do” is write. A lot. One of his current obsessions is The Ranking of Music….he’ll listen to every album by (insert band name here) and then do mini-reviews, ranking them, best to worst. We’ve got the Beatles albums ranked, the Muse albums ranked; right now he’s working through U2. I’ve seen him knock out a 3000+ word essay reviewing every movie in the Marvel cinematic universe (that he’s seen). The dude loves to write. My daughter’s day looks (ahem) a little less focused. She’ll wander down, eventually (I let my kids sleep as late as they want–no demanding a schedule here, either); and she’ll curl up with her math book over breakfast; then take off and go play with her preschool sister for an hour and a half; then suddenly get serious and say, “No, I HAVE to do my reading now,” and work on her reading….get lunch, play piano, rearrange her room, throw in a load of laundry, read a book, and suddenly say, “OH! I forgot about science!” and go attack something science-y with a vengeance….you get the idea. What label do I apply to all this? We have our routines. We also have a huge amount of freedom, and I admit that each time I hear a school bus rumble down our street, I’m a little more thankful everyday. I’m thrilled that my girls get a chance to play and get to know each other, and not be separated for over eight hours a day. I love that my kids can get the sleep they need, and not leave the house at the crack of dawn. I love that they can spend so much time doing what they love, while still learning what they need, and can do it in the comfort of our own home. My “school pictures” tend to be kids curled up in nests of blankets reading, or sitting in the large swing in the backyard with a notebook, or cuddled with a dog while they work on their math…..
There’s really no label for all that. I had to laugh. After twenty-one years of marriage, I’ve learned not to make a big broad statement like “we’re never moving.” But I assured her that we’d do our best. It takes six months to move into a new house. You might be sleeping in your own bed the first night you arrive, but to actually move in and find a space for everything, getting your bearings in a new space–not to mention making any improvements–takes six months. It takes five years of diligent work to really make it yours–not finish it–but feel like yours. This IS the coziest house EVER. Let’s NEVER MOVE. This plan has worked really well….until we overloaded one of the trays with canned goods and broke the tiny plastic bracket holding up the shelf. It really wasn’t a problem; I’d just use a tiny wooden dowel rod to replace the bracket and we’d be set. Except the piece of plastic was still lodged in the hole. No problem….I’ll just move the shelf up a notch. Except there was a piece of plastic broken off in that hole, as well. I’m not proud of how this story ends. (At one point, my sweet husband asked if he could do anything to help, and I might have said, through clenched teeth, “Yeah! You can buy me a new house!”) One thirty-minute real-life Tetris game later, the pantry was entirely rearranged and usable again. Because we had so much food. I still think about that. We had so much food we broke the pantry. How blessed are we? Now we’ve just finished a washing machine meltdown. I noticed back in January that it seemed to have the hiccups: it would hit a point in the wash cycle where it would circle back and start all over again. Once I caught it, I’d just turn the whole thing off and start it over on the drain/spin cycle and call it good. Eventually I called a repairman, who came out and informed me it was working fine for him. (Apparently the “let’s do a quick run through of the cycles” doesn’t trigger the problem.) We bought a warranty to ensure that when it acted up again, everything would be covered. The load I put in after the repairman left didn’t work. Sigh. Yet again, how blessed are we? I have a washing machine that I’ve been able to depend on painlessly since 2012. I finally, finally have a working washer again and no longer have to think about laundry. Last Thanksgiving I decided I was pulling the plug on Facebook for awhile. The holidays were underway and I thought, for my own sanity’s sake, that I didn’t really want to see all the picture-perfect photos of everyone’s picture-perfect celebrations when there were still occasional days in our house where my child’s depression won, and everyone would fall apart, like a domino run, one after the other. Obviously, the election played a part in my decision, too, but at the time my choice was less politically motivated and more out of self-care. I had enough on my plate without having my nose rubbed in everyone else’s apparent happiness. Our days were improving, and I wanted to enjoy that to the fullest, instead of getting pulled into the comparison trap. I still logged in once each morning to clean up notifications and to check the “Your Memories on Facebook” page. As a homeschooling mama, I belong to a ridiculous number of groups, who are always hosting a ridiculous number of events; I did feel the need to check in occasionally there. And as someone who tends to use FB to chronicle the fairly mundane day-to-day life taking place under our roof, the memories were wonderful to look through and laugh at and sometimes share with the kids (and to remind myself that happiness wasn’t always this tenuous). No news feed. No sorting by most recent. No so-and-so liked this or so-and-so shared this or random ads for….why would you think I’d want an ad for this? Can I tell you something? It’s been really pleasant. Fast-forward to now, about three months later. As I’m reading in Psalms, I come across verse 14 in Psalm 34: “Depart from evil, and do good; seek peace, and pursue it.” I stopped to really consider those words, and it occurred to me that they summed up what had been happening over this past accumulation of weeks. Depart from evil. No, I’m not saying Facebook is evil. But the feelings that get stirred up in me, from the political posts or the comments or the “shares” that haven’t been fact-checked; or the envy that crops up when I see someone else doing or getting something wonderful…..those feelings can be pretty ugly. And I’ve been gradually leaving those behind. Seek peace and pursue it. That’s exactly why I left in the first place. Facebook did nothing to help my peace. All it did, in various ways, was stir up stress and anxiousness in me. It’s not in the business of creating peace; that’s not its job. (Now, that’s an interesting question: what exactly is its job?) Turning away from it has helped increase my peace dramatically, and allowed me to pursue things that contribute to peace even more. Let’s be honest….now more than ever we are a people in need of peace. I love our house. God blessed us with a home that has met needs we didn’t even know we were going to have when we moved in. It has been flexible enough to allow my husband to work from home, and still had space enough to welcome our third child. Somehow its four walls managed to expand and allow two foster children to move in, and now it’s relaxed back down to contain a more comfortable three-kids-and-two-dogs family. But I admit to stalking houses not even a mile south of us. It turned out that our Sunday School class’s annual Super Bowl party was in one of those houses. This couple was newer to our class, and when the address was sent out I almost burst out laughing: we’re practically neighbors! (Truly: my husband and son walked home that night.) I was going to get a little taste of what it might be like to live in one of Those Houses. I wondered if I’d end up envious. Or maybe if I’d end up with a lead on a potential home for sale? Instead, I ended up with a near panic-attack. A truly beautiful home, with a small, scenic backyard…that dropped off sharply into the creek. My evening was mostly spent keeping tabs on the three-year-old: Where’s the baby? * Is she back outside? I need to go check. Wait. No. She’s here. Where is she now? I think she’s downstairs. Maybe I need to check? There she is. Etc. I joked with my husband later how glad I was that we had that experience. I could just see us, led on by my glorious rustic imaginings of barefoot big kids playing in the woods and wading in the creek, moving into one of those homes, and then immediately being hit by the reality of a three-year-old who doesn’t swim. Oh, my word….what have we done? I hereby choose to shift my focus onto gratefulness: for a home that I love, for a (relatively) large yard the kids and dogs enjoy, and for the fact that when my youngest wanders out back unattended I don’t think twice. *Yes, we still refer to her as “the baby.” I think it has to do with the age difference in the kids: we have “the bigs” and we have “the baby.” Please bear with me…surely at some point we’ll decide on a new nickname.